A handful of Lightnings and one hearty Buccaneer came out Sunday for what turned out to be a beautiful day of sailing. The forecast was for high winds and possible thunderstorms, but despite a few gusts early in the and some grey clouds it ended up being a wonderful day on the water. PRO Kyra Tallon and her crew got us 4 beautiful races in a steady southerly breeze. The wind filled in over the course of the day such that the gusts diminished and the overall velocity became more consistent in the 12-15 range. There were a few shifts on the day, notably a big lefty in race 3 that ran counter to the overall advantage one gained by sailing right (west) to find breeze and some shifts. 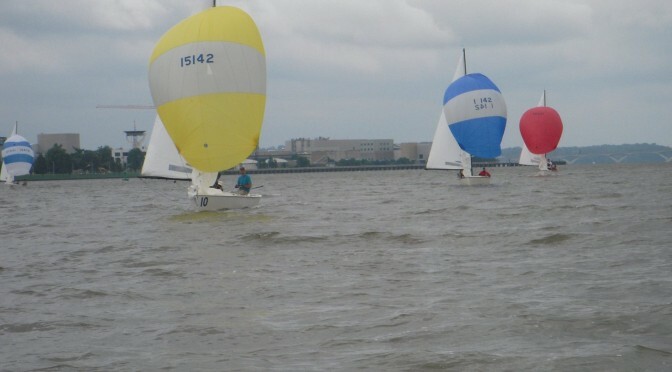 It was a great day to work on boat balance, trim, and downwind angles in a bit of breeze (but not too much). Fun was had by all and we were back to the dock by 2:30 thanks to a high tide that allowed us to sail just outside the airport pier (though I did dig my centerboard into the mud a few times later in the day). Overall it was a great way to round out the Spring Series racing! Amazing photos taken by Nic Bogren on the mark boat. Check the PRSA Facebook page for some more photos from Dan Dunham taken from the signal boat. On the one hand it is crazy that we had cold rain and temps in the 50s today. On the other hand, it is also crazy that this might have been one of the best days we have had all spring! The weather certainly has been crazy, and once again a group of intrepid sailors made the best of it for a day of river racing. We had 5 Lightnings, 5 or 6 Albacores, 3 I-20s, a Buc, and a couple of Lasers out on the race course. PRO Bob Gotthardt and his RC crew did a good job to get us 4 races in a shifty, spotty NE breeze. I was especially pleased to have my parents out on the race course despite the dreary weather. My Dad sailed with me on #14592 and my Mom took some great photos from the RC boat! Scores are posted below, and you can keep reading for some details from my vantage point on Lightning #14592. There will be no on-shore 1000 skipper’s meeting for Spring Series #4 (Apr. 24) because the Race Committee will already be on the water running races for day 2 of the I-20 Cherry Blossom Regatta. PRSA Spring Series racing will start as scheduled on the upper course with the first warning signal at 1125. 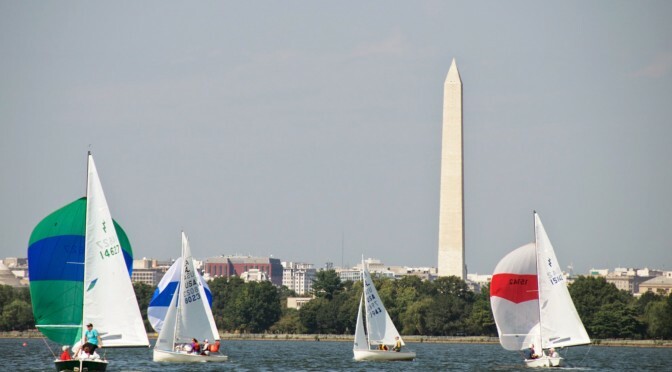 Competitors should be sure to check in with the RC Signal Boat on the water prior to the first warning. Spring Series #3: Light and Challenging! We had a great turnout for Spring Series #3. Unfortunately the weather was a bit less cooperative, providing us summer drifting conditions. A determined RC eventually got us off on a W2 race in a very light and patchy southerly after numerous attempts to find breeze and set a course. I know that at least a few boats were glad that we got that race though, as Sunday saw Lisa-Marie Lane earn her first ever bullet in the Lightning fleet. Staying patient, staying focused on the conditions, and being mindful of finding clear air appeared to be key for her & team As You Wish. Lisa-Marie was followed closely by Kristen Burke (skippering Progressive Plastics) in 2nd, and I’m told that this might mark the first time in Fleet 50 history that we had female skippers finish 1-2 in a PRSA series race. Congrats all around! I was finally out for my first racing of the spring season aboard Lightning #14592 (sailing with regular crew Piercarlo and welcoming new/interested crew Claudio Purificato aboard) and we quickly relearned some of the cardinal lessons of light air sailing: find clear air (especially after the start), find the next patch of breeze, and mind the current. I was caught to windward of a pack of boats on the start, which was a mistake. Groups of boats go very slow together in light wind, and we saw that firsthand. We were too close to bear off and gain speed; tacking away killed the speed we had, so we were fighting back from the rear from the start. Piercarlo and Claudio did a great job finding breeze and clear air up the first leg, though, so we were in the hunt at the top mark. The incoming tide was a big factor on the afternoon, and I saw numerous boats in different classes take themselves out of the race by cutting it too close to the windward mark. By the time you got clear and did circles you were at the back of the pack. We all did a good enough job with the current and we maximized our gains on the few easterly puffs that came through such that we were able to reel in many, but not all, of the 11 Lightnings on the course. After the racing we all enjoyed a great BBQ around the grill. Keep reading for the scores and for some more details from the racing. Please feel free to offer up your own comments here or on the PRSA email listserv!